Promote staff mobility among RUFORUM member universities, and across Africa. The RUFORUM Secretariat announces the availability of 325 PhD training opportunities for the next 5 years under the GTA for the academic year beginning January, 2017. Potential applicants who are teaching staff at RUFORUM Member Universities are invited to submit applications to the RUFORUM Secretariat through a two-step process. Specific criteria for each step are indicated below. Step 1: Identify and apply directly to University for the relevant program of choice to obtain admission into the program. Step 2: Apply to the RUFORUM Secretariat for the GTA. Applicant should complete the RUFORUM GTA application form which should be submitted at the same time that the application form is submitted for PhD admission. No GTA may be employed by another organization, other than the sending and host university during their time of study. 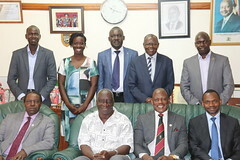 The GTA was initiated by 42 African Vice Chancellors whose universities are members of RUFORUM. I hold a masters in statistics and would wish to study a PhD in statistics, should i apply?